There are three classes of debt  corporate debt (money borrowed by companies), consumer debt ( mortgages, credit cards and the like) and sovereign debt (money borrowed by governments). Around the world, all three types of debt are in record territory. It was excessive consumer debt (U.S. mortgages) that ignited the financial crisis of 2008. Excessive sovereign debt, especially in Europe, will likely spark the next crisis. At the end of 2009 total sovereign debt exceeded US$34 trillion, a gargantuan amount. And the level of debt continues to grow. Without major budget reform, the U.S. for example, is primed to run US$1 trillion dollar deficits every year for the next decade. Unbelievably, it will get worse after that, as health care costs and Social Security payments kick in for aging baby boomers. In Canada despite our reputation for fiscal prudence, our governments debt is 72% of GDP. In Europe, France hasnt run a governmental budget surplus in three decades. The PIIGS (Portugal, Italy, Ireland, Greece and Spain) are the countries in the deepest trouble. They are taking half-hearted measures, pinning their best hopes on the financial forbearance of their European neighbors. What does this mean to us as investors? Its peculiar that although the debt problems in Greece earlier this year got a lot of news coverage, very little has been written about the broader implications. And the implications are serious indeed. Lets take a quick detour to set the stage. 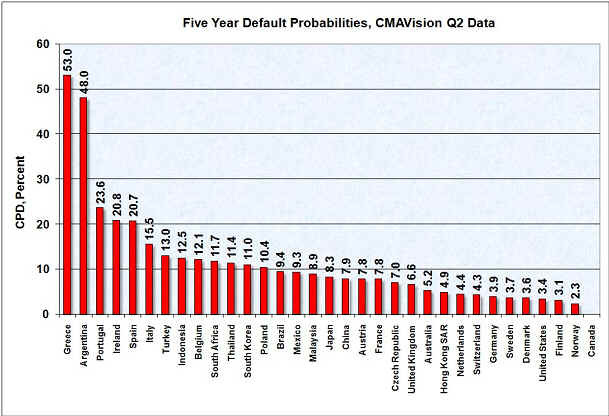 The chart below gives the countries most likely to default based upon market prices of sovereign debt and derivatives as collected by CMAVision (the charts is reproduced with permission from www.calculatedriskblog.com). According to the best guess of the markets, Greece, Argentina, Portugal, Ireland and Spain have significant chances of defaulting on their debts within the next five years. Now the important thing to note is not so much which countries are involved (unless of course you have investments in that particular country) but that the probabilities are high and the amount of debt runs into the hundreds of billions of dollars. Debt is a strange poison. A person, a company, or a country can absorb a lethal dose and seem none the worse for wear. Then something unexpected happens: A credit rating is cut or a loan payment is missed perhaps. The smallest of pinpricks and the borrower goes into toxic shock. Whats worse is that if the debt is large enough, a borrowers troubles rapidly become a lenders nightmare. If you owe the bank ten thousand dollars and cant pay, youve got a problem. If you owe the bank a hundred million dollars and cant pay, its the bank that has a problem. This is essentially what happened in Greeces close call with financial oblivion. The Greek government had been spending beyond its means for years. It had US$395 billion in outstanding securities and the reckoning came when it went to renew some of these loans in April. After a decade of turning a blind eye, newly vigilant creditors discovered that the Greek government had been playing fast and loose with its books. Investors balked. Overnight the country was plunged into a sovereign debt crisis and the Eurozone had to step in with a massive bailout to avert a collapse in confidence. The size and dispersion of Greeces loans caused many to question the strength of the Euro regime itself. In the end Greece did not default but this may merely be the opening act of a darker drama. In a major default event, the damage ripples outward in unpredictable ways. We saw this two years ago when the fall of two American investment banks precipitated a worldwide crisis. A sovereign default in any of the troubled countries listed above would precipitate a similar storm today. Defaults can quickly topple weak banks, revealing incompetence (remember AIG?) and malfeasance (Madoff) in its wake. It is this deluge of unpleasant surprises that can quickly turn into financial contagion and savage the stock markets. What the chart above tells me is that in the next five years, there is a strong chance of yet another financial crisis. The last one chopped fifty percent off the Dow Jones Industrials index and the TSX. What will the next one do? I dont know, but its not going to be a walk in the park. One theme thats served me well over the years as an investor is to be prepared for what can happen because its difficult to know what will happen. As a conservative investor, it makes more sense to get out of the way of a sovereign default tsunami rather than taking a chance that our governments can jaw down a tidal wave. I have therefore reduced my stock market exposure over the past months while things have been relatively quiet. One sector I have not reduced is gold mining stocks because they do well in times of financial turmoil. If a sovereign default happens, stocks will end up much cheaper than they are today. It would then be a good time to buy. My guess is that next year, 2011 may prove to be a watershed year for stock markets. Not only will further pressures be placed on the global economy through growing debt levels but the approaching end of Barack Obamas term as president will magnify any jitters of uncertainty. What if a sovereign default doesnt happen? Wouldnt that mean that we would be foregoing a potential rally in the stock markets? Sure. But remember that even if the worst is avoided, governments must continue to pay interest on their borrowings. That means higher taxes, which would be a drag on economic growth for years to come. What you need to decide for yourself is whether being in the markets right now is worth the risk. With the Dow over 10,000 and the TSX over 12,000 I think the upside is limited. If I am wrong I may forgo some profits but regardless, I am happy to minimize my losses.